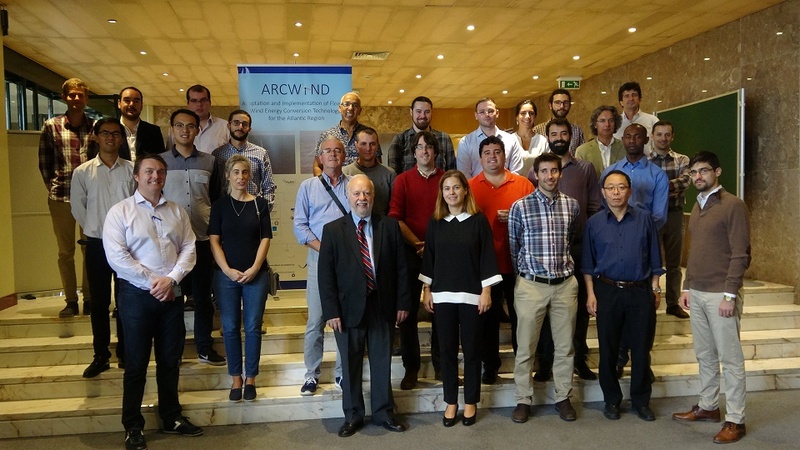 R&D Nester participated in a plenary meeting of the ARCWIND project, which is funded by INTERREG Atlantic Area and which main goal is to contribute to the development of floating offshore wind technologies. The meeting, which was organized by Instituto Superior Técnico, took place in Lisbon on the 11th and 12th of October, and had representatives of all consortium members, which come from the five countries inside the European Atlantic Area (Portugal, Spain, France, United Kingdom and Ireland). ARCWIND project aims to contribute to the development of floating offshore wind solutions and has multiple partners, which are experts in the involved areas, from the resource assessment until the design and prototype testing of floating platforms including also the evaluation of the economic viability of projects and monitoring of offshore systems. The main task of R&D Nester is related to the study of the impacts that the installation of these technologies could have in the electric grid, through the study of the capacity that the grid has to receive new generation sources and the impact that these new sources might have in the grid operation and identify possible needs for grid reinforcements. These studies are performed for the multiple areas identified has having more energy potential, in the five countries under study. Through an active participation in this project, R&D Nester contributes to the planning of the introduction of floating offshore wind energy. This is of upmost importance since this is one of the solutions foreseen for the next years in order to improve the quota of renewable energy in the generation mix at a European level, particularly in regions with a high depth, like the Atlantic Ocean, where fix offshore wind is not a viable solution. All project details can be accessed at: www.arcwind.eu.